Millions of immigrants to the United States filed for citizenship or became naturalized citizens. In the process, they created a paper trail of records that are invaluable in helping us determine where they came from and when and where they arrived in the U.S. Immigrants weren’t required to become citizens, so many were never naturalized. Also, some began the process, but never completed it. And from 1790 to 1922, a wife was automatically granted citizenship when her husband was naturalized, so women rarely appear in naturalization records prior to 1922 (although they may be mentioned in their husband’s files after 1903). TIP: For records before 1906—begin by looking for naturalization records in the courts of the county or city where the immigrant lived. Look first for the petition (second papers) because they are usually easier to find in courts near where an immigrant settled. The petition usually tells where the declaration (first papers) was filed, which could have been almost anywhere in the U.S. TIP: Be sure to ask for all documents—the petition for naturalization, naturalization, and any other relevant papers when you write. 1. Declaration. The immigrant filed a declaration of intention (first papers) to renounce allegiance to foreign governments and in order to later prove he or she had resided in the country long enough to apply for citizenship. Declarations were filed many places. Some were filed in a court at the port of arrival, some en route to a new home, and some in the immigrant’s new home. 2. Petition. 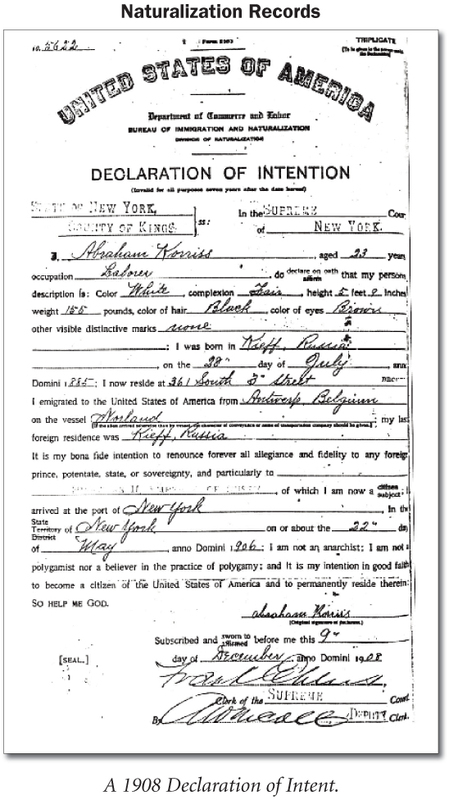 After two to five years the immigrant filed a petition for citizenship (second or final papers). Most often the petition was filed in a court nearest to the town where the immigrant settled. 3. Certificate. After all requirements were completed, the immigrant was sworn in as a citizen and issued a certificate. 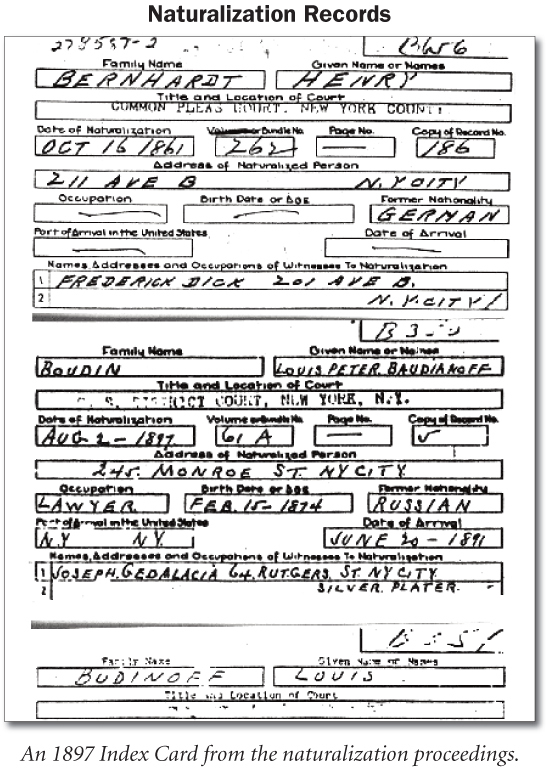 Prior to 1906, naturalization papers do not contain as many details as most of us would like, but they do have the name of the immigrant, the country that they forswear their allegiance to, the town or court where the naturalization took place (although it is possible for the declaration of intent and petition for naturalization to have been filed at different courts), and the name of a witness, often a friend or relative. These records were filed and maintained on a local level, often at county courthouses. After September 27, 1906, the federal government, through the Immigration and Naturalization Service, introduced standard and more detailed forms for the naturalization process which required much more information. 1) Family History Library — check the FHL Catalog under [State], [County] – Naturalization. 2) County Court — write to the County Court. See pages 9.10-11 for info on how to find county records. 1. Call 1-800-870-3676 and ask them to mail it. 3. Fill out an online request http://www.ins.usdoj.gov/exec/forms/index.asp and have them mailed. The minimum information required is the alien’s full name (with other alternate names or spellings) and the date and place (country) of birth. Other useful information to submit includes: name at time of entry into the US, Alien Registration Number, Petition Number, and Name on Naturalization Certificate. Request all records.